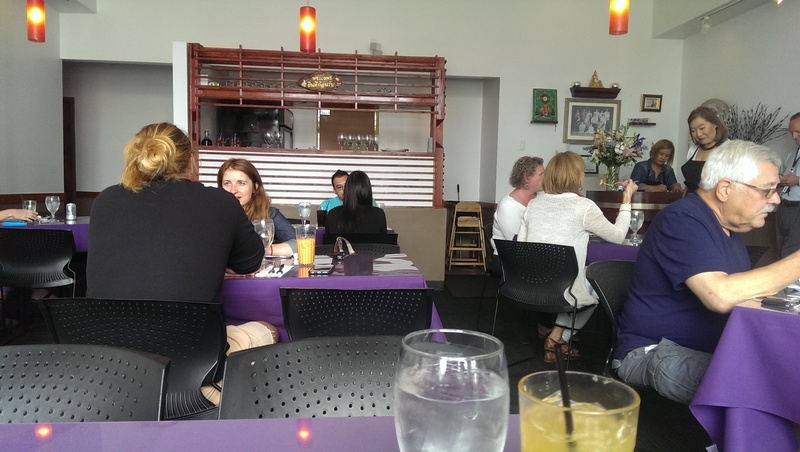 I’ve been meaning to dine at Map of Thailand for over a year now. 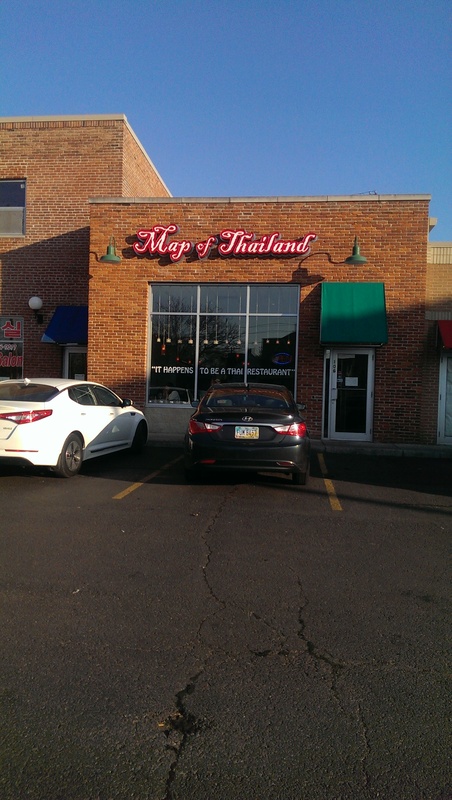 A lot of my friends really love it and feel it is the best Thai restaurant in Cleveland. I had a craving for Thai food one Friday night, so I decided to set off on the spur of the moment to Payne Avenue. I got there at around 7 PM. Several tables were occupied, but it wasn’t full and they were able to seat me quickly. It seems they do a fair amount of take-out business. The restaurant has 10-15 tables, but turnover is quick even during the lunch rush. They don’t serve alcohol, but allow you to bring your own with no corking fee. They have several nice non-alcoholic beverages that you can enjoy as well. 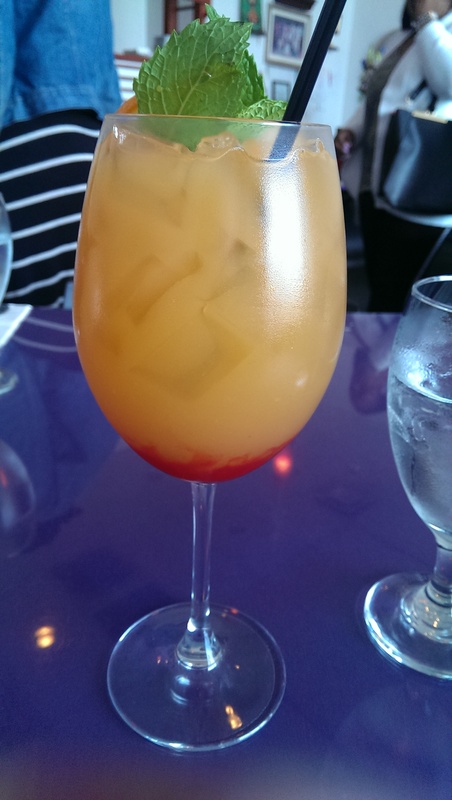 I loved the White Sangria, and their various ice teas are also unique and thirst-quenching. The service was extremely accommodating, making sure my water was always topped up and bringing the food out fairly quickly. When I made an absolute mess trying to put my leftovers in the to-go container the waiter quickly grabbed a towel to clean up the sauce that had poured all over the table. I also love the attention paid to small details like the straw wrapper being folded up like a flower. 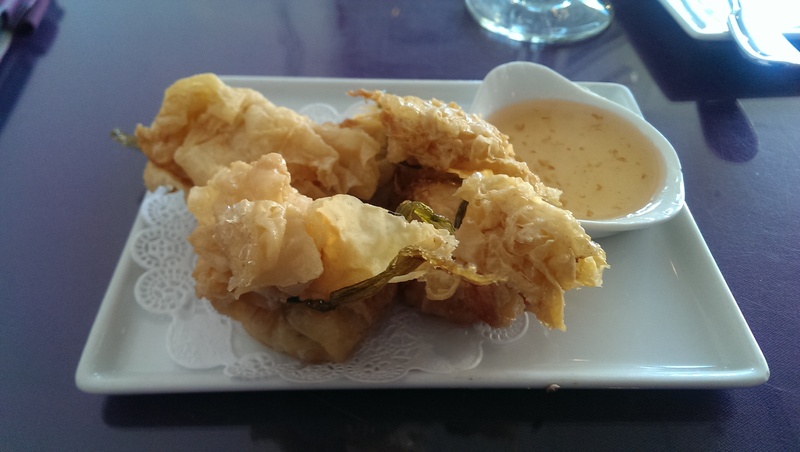 I started off with the Golden Bags, which are billed as “Crisp tofu purses filled with shrimp, chicken, water chestnut, mushroom, and scallion, fried to golden perfection.” I have to say these were really nice. The filling was pretty light and not as dense as I expected. They were indeed fried to perfection; they just left a light sheen of oil on the doilie. They were so light and crispy! They came with a nice sweet chili dipping sauce. I was intending to eat half and bring half home, but they were just too good a nd I ate them all. The photo of the Seafood Coconut Soup (Assorted seafood in coconut cream base soup, seasoned with spices, mushroom, lemon grass, galanga, cilantro and kaffir lime leaf) was the first thing to catch my eye and my interest on the Yelp page for Map of Thailand. It was my favorite thing about the meal. Creamy with just a light kick, I loved every single drop and tipped the bowl to fill my spoon with the remains. It came out piping hot and I actually burned part of my tongue on it, so be prepared to stir it until it cools enough to eat. The soup had two shrimp and two calamari rings as well as thinly sliced mushrooms. It was divine. I could see myself getting addicted to it really easily. It is the most expensive soup on the menu but worth every penny. 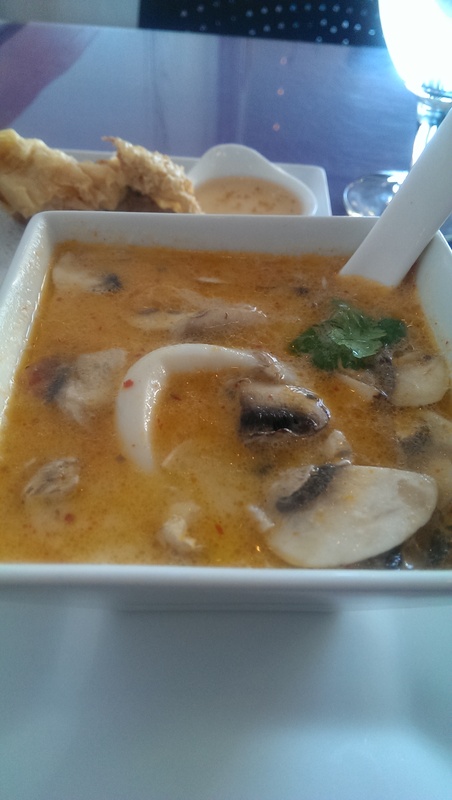 I have also had the Tom Kha Kai soup, but I really recommend the seafood coconut soup. The Tom Kha Kai is good, but it isn’t as flavorful in my opinion. I wasn’t sure what I was in the mood for, and the Lard Nar Noodles sounded appealing. It is packed with vegetables, which really appealed to me. 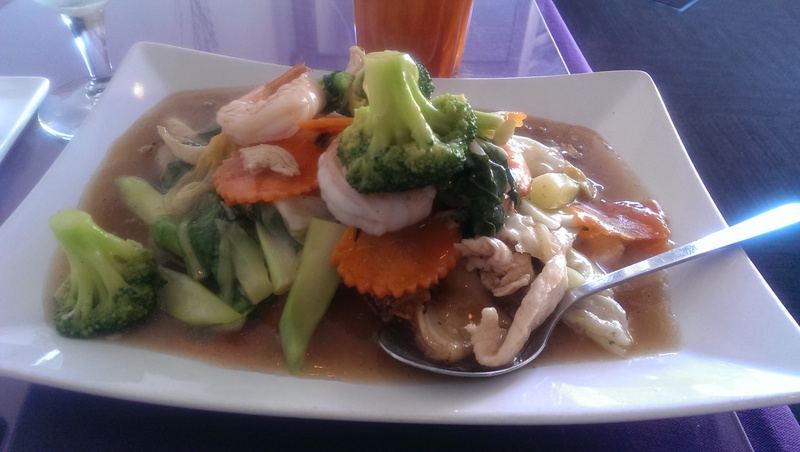 It features wid e rice noodles with chicken, shrimp, Chinese broccoli, carrot, broccoli, and cabbage in a special house gravy sauce. I just wish it had been a tiny bit spicier. The soup was billed as two-star spicy and was perfect, so I am going to stick with spicy here instead of my usual mild. They do not serve alcohol but allow you to bring whatever with no corking fee, which is nice if you want to share a bottle of wine. 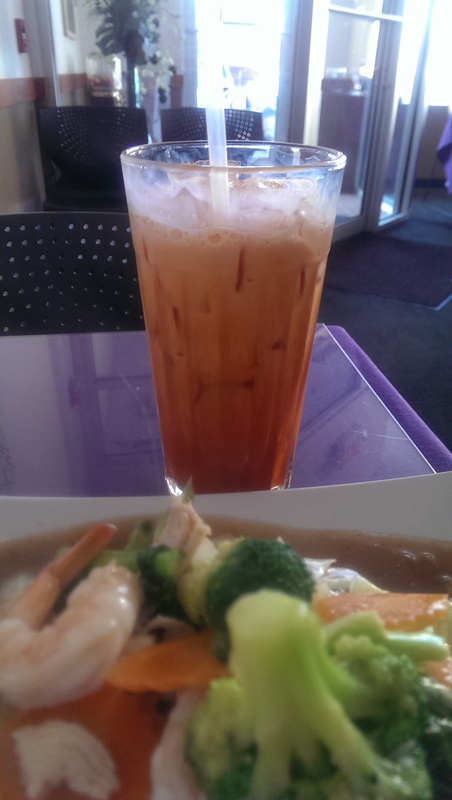 It didn’t matter to me, because I ordered my usual Thai iced tea to cut some heat. 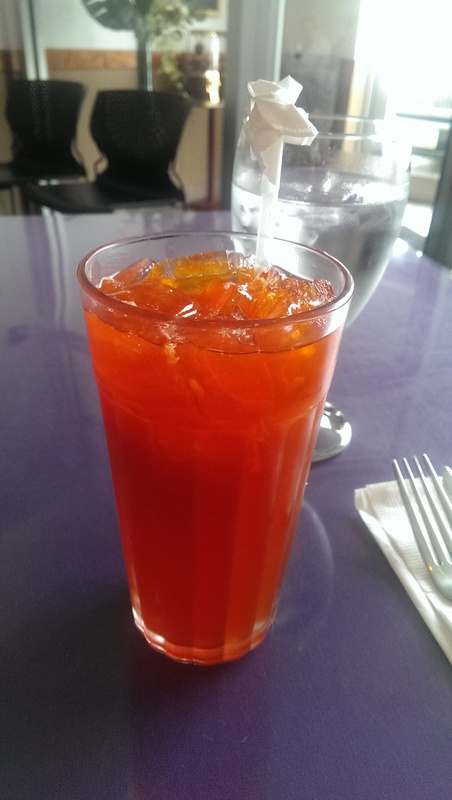 The Thai lemon ice tea (see photo above) is one of the house specialties. It is indeed quite lemony, and I found it to be quite refreshing. That said, I highly recommend the Thai lime ice tea. It is fantastic. If you like lime you will love it. I found it paired really well with the pad thai. My bill for the three courses came to $25.25, which I found to be extremely reasonable for a Friday night dinner. As I was waiting for my food, a gentleman at a table near me said it was “the best meal [he had] had in a really long time.” He was also pleased to hear that his friend’s meat-centric dish could be made vegetarian for him, which is good to know. I came during lunch on my second visit. Lunch portions are a little less, so my bill was even more reasonable at lunch ($18 including tip). I arrived shortly after 1:00 and only a couple tables were free. I ordered the Tom Kha Kai soup and Drunken Noodles. 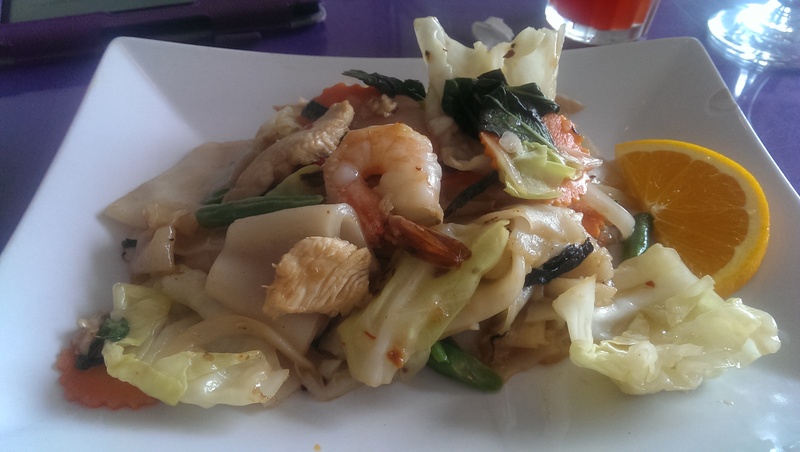 The Drunken Noodles were billed on the menu as two stars (meaning very spicy), but they were able to drop it down to one star for me. It had a nice little kick to it and my mouth was burning nicely by the time I left. I really like their method of flash frying the cabbage, green beans, carrots, red pepper, because the vegetables were crisp and fresh. The noodles were a reasonable size to eat and were nicely coated with the sauce. 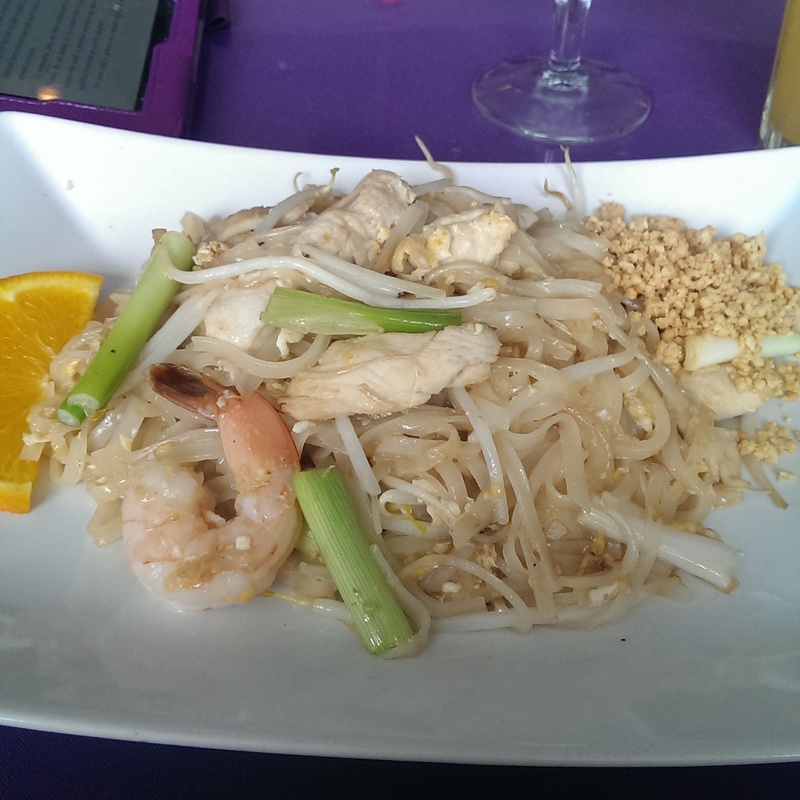 On yet another visit, the pad thai was a little sweeter than I expected, but it was a nice pad thai. If you like it sweet you’ll love this. The portion size was fair, and it had a nice balance to it. Order the country pad thai for a little heat. 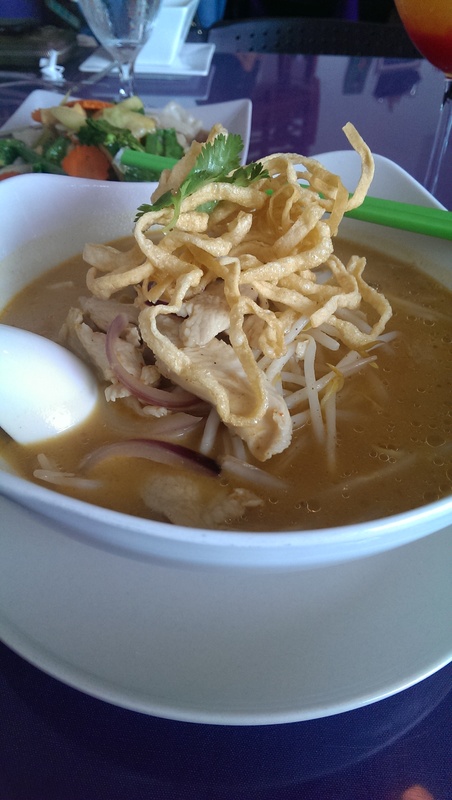 The Khao Soi Noodle is a Thai coconut curry noodle soup with chicken. The red curry sauce is well-executed and addictingly spicy. 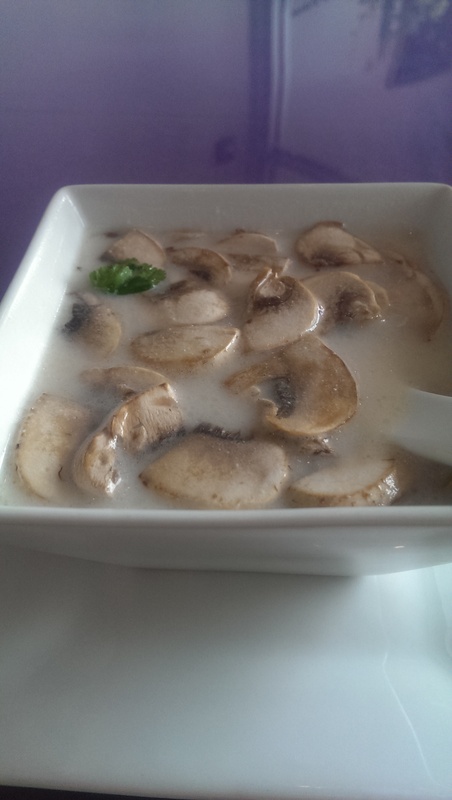 I didn’t like it as much as the seafood coconut soup, but it had a good flavor and nice depth. The crispy egg noodles on top were a good palate cleanser to balance the spice. If you like Thai food I suggest you give this place a try. I’m addicted to the seafood coconut soup, so I will be back again very soon. They are open Monday through Saturday for lunch from 11:30 a.m. to 3:00 p.m. and for dinner from 3-9:00 p.m. (9:30 on Saturday) and noon to 9 p.m. on Sunday (although their website says they are closed on Sundays – call first). I suggest checking out their website if you are curious about what the dishes look like. The site has a photo of every single item they serve (except the beverages), which is very impressive.